Reading Homer Price this week, a collection of six stories written and illustrated by the venerable Robert McCloskey about a boy named Homer who lives two miles outside of midwestern Centerburg "where Route 56 meets 56A." I started reading the first story entitled "The Case of the Scentsational Scent," so I could preview the book before reading it to Avery. The tale starts off with Homer acquiring a new pet skunk which he names "Aroma," and honestly, it was hard to put down! 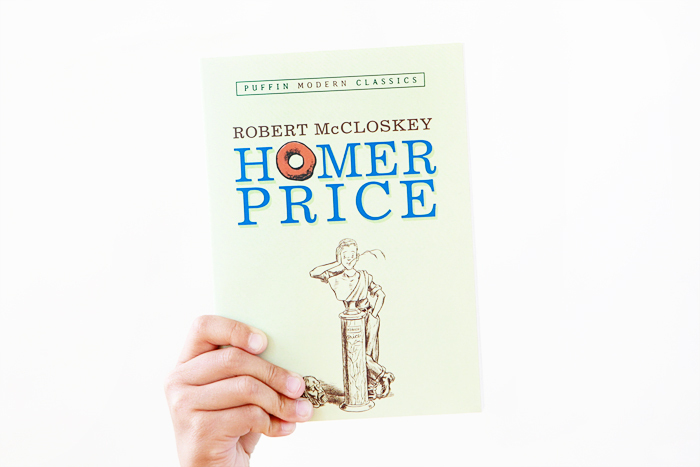 McCloskey's vivid characters and insight into small-town life make Homer Price an engaging read. It always amazes me how one person could be both a deft writer and illustrator, but there you have Robert McCloskey. What is everyone's favorite work by him?